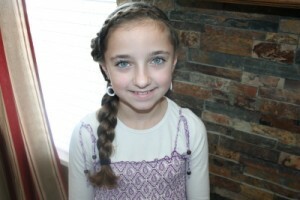 Over the past few months I have received a few inquiries asking for hair headband hairstyles . You could say that the hair headbands are somewhat of a trend that is very popular with teens today. 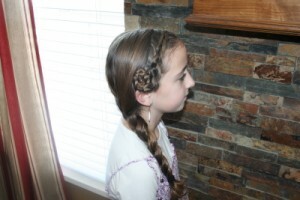 This style is a fairly simple one, and can be done in the normal French Braid style, or in the Reverse (Dutch) Braid style, depending on how you want it to look. Also, you can finish the headband in any number of ways. You can leave the braid hanging on the one side, or you can do what I did and roll it up and bobby pin it into a super cute rosette. The latter is not a new concept and is not something I could claim, but the combination is wonderful. Side View… I was planning on leaving the hair as filmed in the video, but… as you can tell from the photos, I decided to pull the rest of the hair into a loose side braid. You could leave the hair down straight, curl it, or do a side flipped pontail or a braid like I did. Your combinations really can be endless and entirely up to you! Front View… Items Needed: Spray bottle, rat-tail comb, brush (if needed), 1 large hair band, 1 small hair elastic, hairspray, 2-3 bobby pins, and accessories (if desired). There you have it! If you like this hairstyle… be sure to let us know!